New Tau army - non-battlesuit army viable? Hello, fellow worshippers of ranged, blue-glowing dakka. 1. The clean look. Be it Tron, clean edge highlighting or bright colors, this doesn't fit into my view of the 40k universe. The 4th sphere expansion serves as a template in that regard: With no way of just pulling back when facing overwhelming opposition, things don't go as cleanly as they should. Hasty field repairs, damaged equipment, injured warriors is what I'm aiming for, instead of comic-y poster boys. 2. The part where tactics might become problematic: I don't like GW's recent trend of just building even bigger battlesuits, with ever more obvious disregards for engineering principles. Like the gigantic battlesuits, with huge thrusters, connected to the suit by what could have been a space marine's lower leg. Add to that the ever-more agile and dancer-like poses, and this heavily contradicts the style I'm aiming for. Ghosts are okay, they look more realistic and bulky anyway. Infantry (mainly lots of firewarriors and pathfinders), tanks (hammerhead, even if inferior to suits), drones, flyers (preferrably FW, awesome design). Few or no suits, no allies. It should look like a battle-hardened army, not a gundam comic. Firewarriors with Bork'an, fireblade and grav accelerator drone seem ridiculously useful, while being as cheap as it gets. Some infantry in devilfishs, drones and piranhas to cover the midfield. Hammerheads only seem useful combined with Longstrike, so the vehicles might get shifted to T'au, and maybe include a few of the FW turret variants to cover the broadside's roles. With that much long-ranged S5, AT seems my primary concern. Would it work out to just slap seeker missiles to every possible vehicle, markerlight something big turn 1, and drown it in seekers? Especially Hammerheads with Longstrike seem useful in that situation, hitting on rerollable 2+ even when moving. Deep striking drones seem fun too, but require drone controllers to be anywhere near effective, how could that be done? Ghosts can take one AFAIK, but those probably won't stick around for a few turns until the drones can DS outside of the deployment zone. As for flyers, I intend to include both new FW flyers for aesthetics alone. The GW ones look okay too, but which would be really useful? What is your experience on this approach, could it work without suits? Have I overlooked something, or is something missing in that army? Well drones and firewarrior are pretty good but only provide S5 AP0 dakka. Breacher provide some better dakka but only at basically melee range. Without Battlesuits you're playing without most special weapons that are normally available to T'au. That means no Fusion Blaster, no Cyclic Ion Blaster, no Flamer, no Missiles and no Plasma. It'll be viable in more casual matches but also rather bland unless you go tank heavy I guess. Flyer add some more variety as well, especially if you add Forgeworld units. Well, the FW options at least provide a bit of variety. TX-42s and heavy bombardment/fire support hammerheads are definitely on the list, as are Tiger Shark and Barracuda. Which all benefits from Bork'an rather nicely, compared to other septs. With a tank heavy detachmend I'd go with T'au or even Dal'yth over Bork'an tbh. T'au for Longstrike and his aura, Dal'yth for easy cover bonus for tanks to buff them to a 2+ save. Probably T'au tho. I'm still undecided between T'au and Bork'an. Dal'yth would be efficient, no question about that, but it just tempts me to stay static, which isn't my preferred playstyle. T'au opens up multiple characters - longstrike for improved hammerheading, and darkstrider because he just fits my army theme. The stratagem is really useful too - combined with a lot of seeker missiles, it should guarantee something big ends up very very dead. Only downside is the sept buff itself - overwatch is nice, but pretty much wasted on shooty enemies. Bork'an has a rather worthless stratagem, but the buff ensures a higher number of shots in most situations, passively increasing efficiency in the one phase we need, unlike the T'au buff that only happens to fringe units. 42" drone-augmented fire warriors can target not just the midfield, but reach backfield units too. Which stacks nicely with 42" markerlights. Even without drone, they stay out of effective range for most standard weapons (24" + 6" move). Rail rifle TX-42 end up with an effective double tap range of 36", which might be a useful firefighter. This edition, I've only had two games against Tau, which ended up the same: Both armies' midfield units clashed, got shot up by backfield units - and the backfield units couldn't reach anything, making the last rounds rather uneventful. Bork'an would help reaching out to the backfield targets, instead of exposing the squishier units to short-ranged firepower in the process. On the other hand, T'au would be forced to get closer, and have more midfield units around to create board control, while having a considerable assault deterrent. As my paint scheme isn't based on the established ones, I guess I'll experiment with it when I have the models. One detachment won't be enough anyway, having a T'au tank company and Bork'an infantry might be the way to go. Edited by MajorNese, 15 May 2018 - 06:51 PM. Can i suggest a middle ground? With my force I’ve used 2 battalion detachments. Also another plus is that the force has 13CP’s! This is all still thearetical but that’s the approach I’ve gone with. As said, I'd go with T'au with the tanks. For the Firewarriors going with Bork'an is definitely a very valid choice. You can always go for Piranha w/ Fusion Blaster. I love mine! They are rather cheap, very fast, annoying with a lot of punch actually (1 Fusion and 8 S5 shots from the drones). And the drones actually can go on, once the Piranha is shot down... And with Hammerheads you DO have other weapon options for long range engagement. I once played a list with 3 Cadre Fireblades, 60 Fire Warrior, 20 Pathfinder, Longstrike and 3 Hammerheads, plus the piranha mentioned above. Was fun Next up on my try-list are 10 Vespid and adding Darkstrider to my Fire Warrior list. I love my Sa'cea Piranha with Fusion Blaster as well but I'd be lying to myself if I were to say it does good work as main anti-tank source ... kinda like my Sa'cea Stealth Suits with Fusion Blaster. If you are looking to go 'troop heavy' I recommend pathfinders with special weapons. Lots and lots of 'em. In terms of Septs, I guess a mixture of T'au and Bork'an should be the way to go. As I'll use FW Index units, do I use the weapon profiles and points cost from the codex? For example the TX-42 has two rail rifles, those got cheaper in the codex. Piranhas seem like an ideal distraction unit - fast, clearing chaff, and dropping off another distraction unit as part of the deal. Guess the fusion blaster would attract a bit too much attention though. For that I'll use TX-42 with rail rifles - 18" rapid fire, +1T/+1W/+1Sv, that should survive a bit more attention. Except for that, Sanul's list sounds fun, though I'd add a few drone units or something. As a sidenote, does anyone know how to do the FW paint scheme for the Tiger Shark? Looks pretty much like what I envisioned. Edited by MajorNese, 16 May 2018 - 10:47 AM. Which paints to achieve the sand-but-brown-y effect? I've seen the Tau ochre so damn often, I definitely prefer this one. And the army starts to gain models. Two piranhas, 8 pathfinders, 8 drones so far. I casted or cast-formed enough bases to start the color tests, but I gotta make a bigger mold for vehicles and such. Unfortunately work travel will take until mid-july, meaning I'll just paint up my remaining skitarii there, and only build tau until then. Next up would be a lot of fire warriors (both strike and breachers), the one or other cadre fireblade, and 4 devilfish/hammerheads. I basically bought up two not-really-started army projects to cover the basics. The devilheads are built and painted, which is a less expensive/risky way of trying out battle damage without potentially ruining an otherwise flawless model. Other conversion idea - a piranha commander conversion. Without battlesuits and fish priests, only fireblades/darkstrider/longstrike remain as HQ choices. 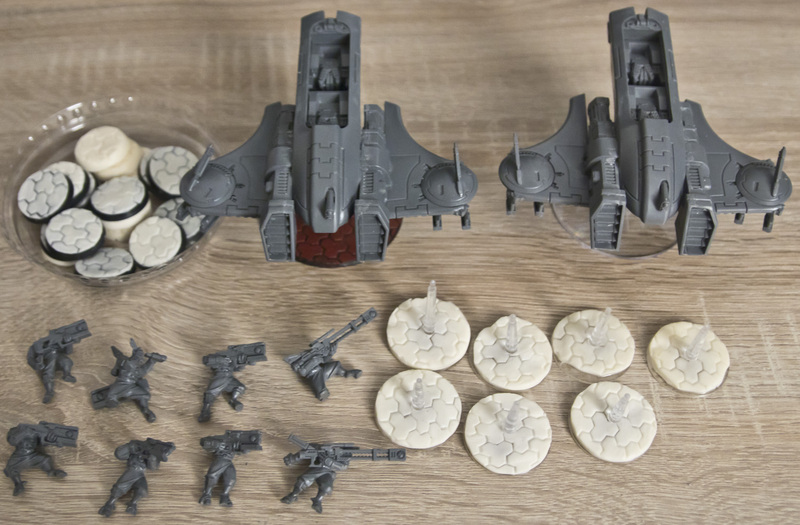 I'll have crisis sprues anyway (Start Collecting), I consider shortening a piranha, adding crisis jetpacks/weapons/armor plates and playing it as Enforcer commander. Same toughness/wounds, just 3+ armour instead of 4+ (armour plates), that should be a rather good count-as. Now the hard question, which weapons? Missiles would be fun, shooting across the board, but a shorter-ranged version (cyclic ion blasters/supernova launcher) is tempting too. Once I have stuff painted up, I'll start a log thread. Honestly that appears to be a bone color with washes and weathering applied to give it kore of,that sandy color. Really hard to say as the underside appears to be a lighter less weathered appearance. I'm not sure of the colours but i do know if you email the guys at FW and ask nicely they will probably give you a run down of the colours they used.. others have asked before and got responses so give it a go?..